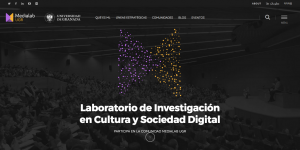 This June I had the pleasure to spend one week at the MediaLab of the University of Granada (Spain), so I could get to know in more detail the impressive catalogue of initiatives they have developed in their still short – but already very intense – history. The ultimate goal of MediaLab UGR is “to..
Blog : Celebrating the end of term with the Arts Gymnasium participants! 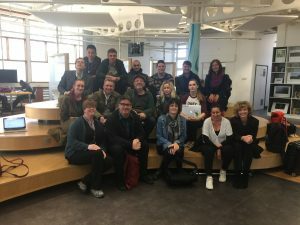 Katherine Wimpenny, Lead Researcher Arts Gymnasium, On 4th July participants from across all the Arts Gymnasium weekly workshops taking place in Coventry, came to the DMLL for an end of term sharing event. This was the first occasion in which the project participants shared aspects of their creative work in front of peers, family..
DMLL will be hosting a Training School (TS) of the European Literacy Network (ELN) in September (4th-6th), with a special focus on approaches to assessing literacy skills in a digital world. The three-day TS will include a variety of presentations, round-table discussions, poster exhibitions and workshops aiming to both share expertise and envision new ways..
To listen to Sammy’s audio please click here It has been a wonderful journey to be part of the Arts Gymnasium Shine On group and my placement has extended to a rich experience that has greatly influenced me as a musician and aspiring arts practitioner. I was given the freedom to explore and bring my..
Katherine Winpenny, Research Lead, Arts Gymnasium In Bristol, 19–23 Jun 2017, Sarah Merry, DMLL, Eline Kieft, C-DaRE , Koula Charitonos, Open University, and myself, presented a research paper about our work on the Arts Gymnasium, as a performance piece at the Culture, Health and Wellbeing International Conference and Exchange, We presented our research process as a..
Katherine Wimpenny, Research Lead, Arts Gymnasium, DMLL Over the past few weeks we have been sharing our evaluation research on the Arts Gymnasium project, a collaboration between the Belgrade Theatre, Coventry University, and Age UK Coventry, funded by the Esmee Fairbairn Foundation. The Arts Gymnasium project is investigating the value of arts and drama workshops..
Blog : Find us at the CU Staff Conference! 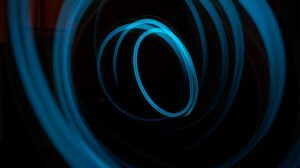 The DMLL team will be out and about at the Coventry University Staff Conference celebrating this year’s themes of Achievement, Equality and Diversity! Find us Thursday and Friday at the Lab stand and at various sessions happening through out the two days. 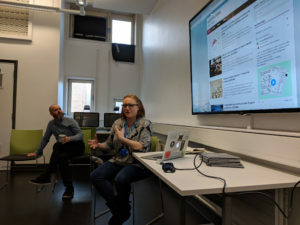 Tweet us: @disrupt_learn #CovUniCBF17 Thursday: 10.20 – 11.00am (EC1 23) – Oliver Wood – Flip the..
During the first week of April it was our pleasure to have Audrey Watters (http://hackeducation.com/) as a Visiting Fellow at DMLL. Audrey is a journalist and independent scholar specialising in the political economy of educational technologies. Her work focuses on the interplay between politics, pedagogy, business, culture, technology and educational institutions. 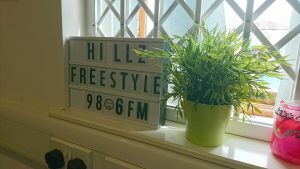 Since 2010 she has..
Today I had an unexpected trip to a local radio station HillzFM to help support my colleague, Katherine Wimpenny, in promoting the Arts Gymnasium project, and in particular the showcase being held at the Albany Theatre Coventry on June 10th. The Arts Gym project on paper has been developed to ‘help support the over 50s..